Coenzyme Q10 is essential to human life. Research indicates that supplementation with this nutrient may support normal heart function, provide antioxidant protection and maintain the health of the gums. 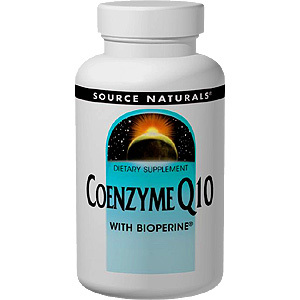 Additionally, Bioperine (Black pepper extract) may enhance the absorption of CoQ10. An oil based softgel is fat soluble and maybe more bioavailable than tablets or powder filled capsules. Contains no yeast, dairy, egg, gluten or wheat. Contains no starch, salt, preservatives, or artificial color, flavor, or fragrance. One softgel daily with a meal, or as recommended by your health care professional. Store in a cool dry place. Warning: Not for use by pregnant or breast feeding women. Do not use if ether tamper evident seal is broken or missing. Keep out of the reach of children. Coenzyme Q10 (Ubiquinone) 100 mg, Bioperine (Black pepper extract) 3 mg.
Other Ingredients: Rice bran oil, gelatin, beeswax, lecithin, purified water, annatto oil, and titanium dioxide. Coenzyme Q10 With Bioperine 100 mg is shipped in a discrete, unmarked package. Orders are processed immediately and usually take about 3 to 5 working days to be received. We do ask that you try it for 2 to 3 weeks to feel the full effects. Any information received is used only for order processing and shipping purposes. Your information, such as e-mail address, will never be disclosed to a third party.